Tim and I are happy to be back on the blog, now officially as Mr. and Mrs. Foley! So much in our lives has changed since we last wrote, and so much of our lives are in a time of transition still, that it feels as if new introductions are in order! We two high school sweethearts have finally entered into the sacrament we’ve been preparing so long for, we moved to a new city and into our home together, Tim started a new job as a government consultant as soon as we got back from our honeymoon, and I am about to begin my new job as a high school religion teacher. 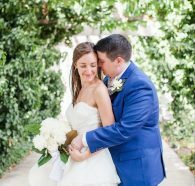 As you can probably imagine, we’ve been pretty busy with all of these transitions, and we realized when we got home from our honeymoon that settling well into married life was going to take some intentionality on our part so that we don’t miss the beauty and uniqueness of our days as newlyweds! This time immediately following our entering into the sacrament is so special and sacred. By God’s grace we have become husband and wife, and neither of our lives will ever be the same. It is easy to see the exterior ways that our lives are different now – the new city, new home, new jobs – from before we got married. The internal things, however, are less obvious to the naked eye, like the new bond, sacramental grace, and increased responsibility to the other person. These things, therefore, need serious guarding and intentionality. We need to guard our hearts, our minds, and our schedules so that we are intentional about savoring and nurturing our marriage in its brand new, infant days! First, I cannot say enough good things about getting into a fruitful daily routine in our early days of marriage. Settling into our daily routine of wake-up times, dinner times, evening activities, and yes, even daily chores, has given us a rhythm we look forward to each day and has given us both the space to serve each other. For example, we realized quickly how much we both enjoy hanging out in the mornings together before we go to work, so we both make an effort to get up earlier and adjust our schedules in order to savor that time together. Doing this also means that we have the opportunity to serve each other in different ways. A second way we have been intentionally present to each other during this past month is by sitting down at our dining room table for dinner each night and eliminating distractions. While it is so tempting to come home from work and sit down on the couch, kick our feet up, and eat with plates in our laps, it has been so good for us to have a more formal dinner. Sitting face-to-face, without the distraction of our phones or the TV, has given us the opportunity to be truly present to each other, to hear about each other’s day, to share our thoughts, and to love each other a little more through that quality time together. A third, and the most important way, that we have been intentional about our time as newlyweds is through setting aside time to pray together each day. Each evening before we go to sleep we take time to read a devotional together before praying aloud for our intentions and then praying our usual litany of bedtime prayers. Sharing this time of prayer together, especially through the conversation following the devotional and the praying aloud of our intentions, has helped us be present not only to the way God is working in our relationship but also to the spiritual well-being and needs of each other. Knowing the prayers that are on another person’s heart is such an intimate thing, and sharing this with each other daily has brought us closer to God and closer to each other. Every couple is different, and every couple’s newlywed days will be different! These are just a few things that have helped Tim and me be present to our marriage and the grace that God is pouring into it in our days as newlyweds. It has been so fun and grace-filled to begin our life together as a married couple, and we are so grateful to God for all of the blessings that He has given us during this time.